Studying mice, investigators from Washington University School of Medicine in St. Louis showed that a specific energy source called NAD is important in cells responsible for maintaining the overall structure of the brain and for performing complex cognitive functions. NAD (nicotinamide adenine dinucleotide) is a molecule that harvests energy from nutrients in food and converts it into a form cells can use. 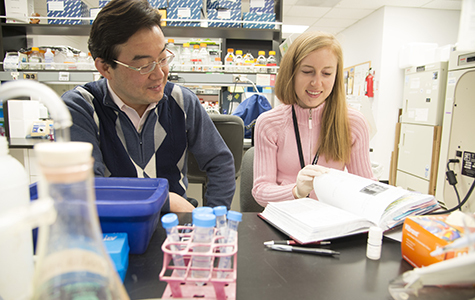 Shin-ichiro Imai, MD, PhD, (left) and Liana Roberts Stein, PhD, showed that certain types of brain cells may be critically dependent upon one specific energy source called NAD. NAD harvests energy from nutrients in food and converts it into a form cells can use. The work appears in two journal articles — in the May 8 issue of The EMBO Journal, a publication of the European Molecular Biology Organization, and in a recent issue of The Journal of Neuroscience. The investigators looked at two types of brain cells: adult neural stem cells, responsible for maintaining supplies of neurons and their supporting cells, and forebrain neurons, vital for performing complex cognitive tasks. In The EMBO Journal, they reported that NAD levels decreased with age in the mouse hippocampus, a vital region of the brain for cognition. The researchers then used genetic techniques to find out what would happen when NAD manufacturing is turned off in the adult neural stem cells of the mouse brain. According to the researchers, there are four pathways of NAD synthesis, and the scientists focused on just one. They wanted to find out whether this particular pathway — a longtime focus of Imai’s lab — is important for these cells or if the other routes could compensate. The pathway begins with the B vitamin nicotinamide. Cells take dietary nicotinamide and, with a helper protein called Nampt, manufacture a molecule called NMN, which then is processed further to make NAD. When Stein eliminated Nampt from neural stem cells, several significant changes took place. Levels of NAD dropped, and the neural stem cells stopped dividing; they stopped renewing themselves; and they stopped being able to create important cells that insulate axons, the “wires” that carry electrical signals throughout the brain. With less insulation, these signals slow down, impairing brain function. Imai and Stein pointed out possible therapeutic implications of this finding, especially in light of what is known about cognitive decline in aging and certain diseases. Imai and Stein also found they could prevent the loss of the neural stem cells missing Nampt by giving the mice NMN, the next molecule in the chain of events leading to NAD. Imai called this finding exciting because it supports the possibility of a future NMN supplement. 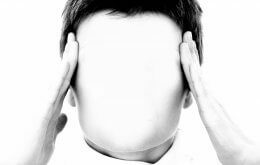 In addition to maintaining stem cell populations and keeping the brain supplied with all its cell types, the investigators showed that NAD also is vital for the process of cognition itself. Reporting in The Journal of Neuroscience, they showed that neurons of the mouse forebrain depend heavily on NAD in normal cognitive function. Instead of deleting Nampt in stem cells, this time Stein deleted it only in neurons of the forebrain. All other cells were normal, including those that make axon insulation. Without Nampt and its eventual product, NAD, in forebrain neurons, the behavior of the mice changed dramatically, according to the investigators. 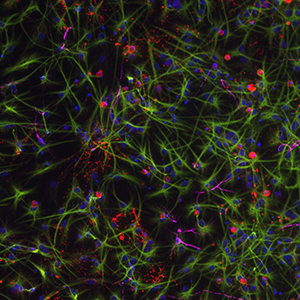 Neural stem cells differentiate into three different cell types: neurons (purple), oligodendrocytes (red), which produce axon insulation, and astrocytes (green), which also support neurons. Cell nuclei are shown in blue. Stein pointed out that these neurons are in a region of the brain known to be particularly vulnerable to neurodegenerative conditions from Alzheimer’s disease to stroke. This work was supported by the National Institutes of Health (NIH), including the National Institute on Aging (grant numbers AG024150, AG037457), the National Institute of Child Health and Human Development (P30 HD062171), the National Institutes of Health Training Grant (T32 GM007067), the National Institute of Mental Health (MH077791), the NIH Neuroscience Blueprint Center (P30 NS05105), the Alafi Neuroimaging Laboratory of the Hope Center for Neurological Disorders and the Ellison Medical Foundation. NMN was provided by the Oriental Yeast Co. of Tokyo, Japan. Stein LR, Wozniak DF, Dearborn JT, Kubota S, Apte RS, Izumi Y, Zorumski CF, Imai S. Expression of Nampt in hippocampal and cortical excitatory neurons is critical for cognitive function. The Journal of Neuroscience. April 23, 2014.